This is the 5th album of the Swedish death metaller. I wasn't sure, if they can top Versus The World or at least record another album on this level. Well, first I thought that they can't keep up with their last album, but then I realized that this album just needs more time. Johan Heeg and his companions recorded a great death metal album, but it ain't as 'catchy' as the last. There isn't another Victorious March, but there are a lot good songs like the title track Fate Of Norns and Where Death Seems To Dwell. The Fate Of Norns is a mid-tempo tune and lives from the guitar riffing. The hammering drums and pounding bass are just the playground for the guitars. If the vocals would be less death metal like this song would also be interesting for power metal fans. This one is at the edge of death to power metal. Fast parts get them back to the shores of death metal... Almost black metal blasts. A track which offers a large variety. On Valkyries Ride they are more complex and technical, but still powerful. 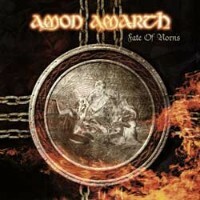 Mainly mid-tempo they show a little different side of Amon Amarth. This album needs time to grow, but after a few spins the magic is there and it becomes a killer. Doing another Versus The World would have been easy, but not what the wanted - it seems. Nothing for death metal purists! But this album will be interesting, even if you listened a hundred times. The new stuff will fit well into their live set. I can't wait to see the Vikings conquer the stages of Europe!